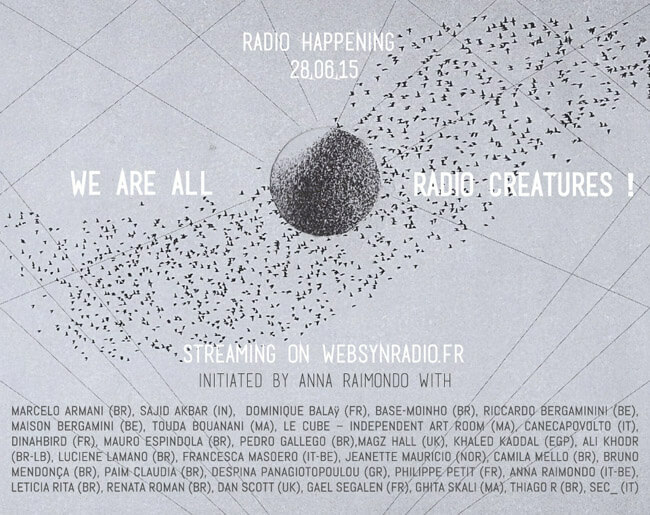 Accueil > Événements > listening session > We are all radio creatures! “We are all radio creatures” is a project of intimate geography joining people and spaces chosen from the artist, through a moment of collective and common listening via streaming in physical spaces all around the world. Apartments, art and music centers, galleries will resonate locally and in unison the 28th of June, proposing a listening session to its local audience. The playlist is composed by an aggregative curatorial approach in which each one proposes some works to diffuse, with the intention of defending a plurality of approaches to the radio art today.